oil on panel. This painting was done for a virtual international art exhibit out of England called "Run with the Fire". 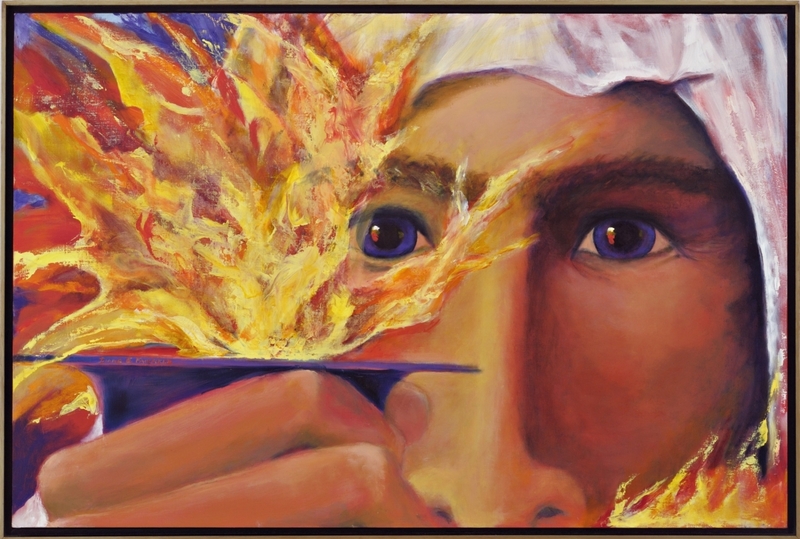 The exhibit was planned by 3 Christian art organizations to be timed with the London Olympics and capitalize on the Olympic theme of running with the fire - the Olympic Torch - and connect that theme with Pentacost. Each artist that was selected for the exhibit was asked to paint a piece based on what another artist in the exhibit wrote about the theme. The exhibit it is being shown and distributed on DVDs, thus the artists were able to retain their original work. "My vision for Run With the Fire comes from the passage in John 14:12-27 where Jesus literally passes the torch to us. He promises that whoever believes in him will take up his baton and do even greater works than him--than Jesus himself! What an inspiring declaration--he literally speaks life over us and calls us out of ourselves and into greatness by speaking our destiny as people who are called to follow and obey him at all costs. Immediately after Jesus promises that we will have all authority to do great things, he promises that the Holy Spirit will come and be with us forever. We cannot step into our Kingdom destiny--doing these even greater things--unless the Spirit of Truth fills us and lives in us." Combining that with what Jesus said in Acts 1:8 just before He sends the Holy Spirit, I prayed to know what He would have me paint in response. This painting is the image I received in prayer.